On Tuesday the President of the United States stood before the United Nations General Assembly in New York City and made a bold and unequivocal statement for American values and ideals. The President made no apologies as he recounted how America’s success has uplifted the world, as he described how it was our country that selflessly rebuilt Europe, freed continents from the grips of both tyranny and poverty, and have promoted a belief in human dignity and equality that has transformed human relations and rights in a way never before seen. After his noble speech, unfortunately some decided to focus on a few gaffes, reactions, and minor points as compared to the crux of the message. Some pointed out that a few nations’ diplomats grinned or laughed, as some always do to whoever’s speech and even though some of it appeared to be “with” rather than “at” the President. A few late night hosts pointed out a few word mispronunciations even as they themselves have never born the weight of speaking before all of humanity gathered and with the schedule and pressures the leader of the free world faces. Others derided the President’s supposed “bragging” about himself at the UN while ignoring the fact that the President was describing the progress the country as a whole had made and how it shows why we are worthy of emulation. Note that in all these cases, these “reporting pieces” appeared to be done by CNN employees, not outside contributors, and made largely to appear as supposedly neutral, fact pieces. The outright “opinion” output was of course leaps and bounds worse. And can anyone in the media seriously and sanely wonder why so much of the American public, 72% by a recent poll, believe the mainstream media to be purposefully engaged in distortion and misrepresentation? 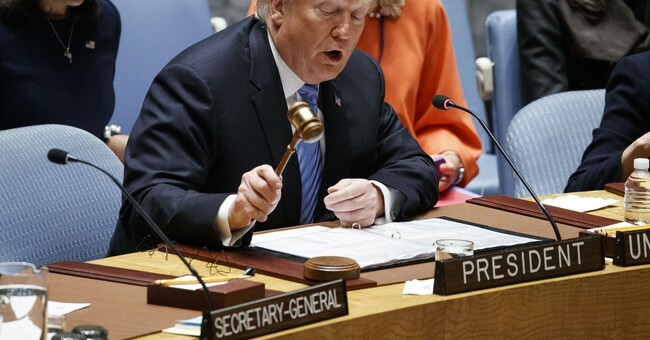 When the President of the United States comes before the United Nations, it is largely symbolic as the content of the speech will deliver little surprises. Nonetheless, like the State of the Union here at home, the mention or non-mention, or prioritization, of certain topics defines how other nations and peoples look at us and how they believe we will act in the world. It is a time to be looking both outward and inward, to be engaged in serious examination and thought about America’s current place in the world and the challenges we face, rather than focusing on a slurred word or playing into some pre-existing narrative deriding our President personally. I liked President Trump’s UN Speech. Of course he had a historic speechwriting team behind it, but it was still his. We currently are at a time in the world where American leadership is being increasingly challenged by those who would seek to create a multi-polar world with not only different rulers but different values, rights, and limits on freedoms. It is clear that under President Trump’s watch, America isn’t going to let that happen. Perhaps if some of those in the mainstream media would stop the navel-gazing and fear-mongering and instead begin thinking about bigger ideas, the broader picture, and the serious questions our nation and world faces we have a chance of keeping our nation prime and at the top.